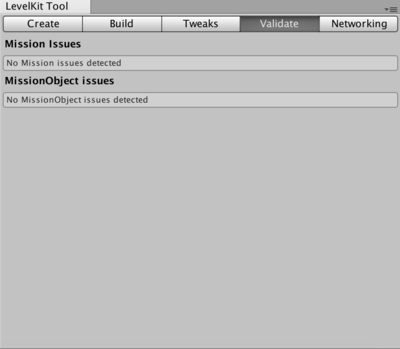 ... (Fill in required components here) gardless of whether you are using the Win/Mac/Linux build of the Unity Editor. 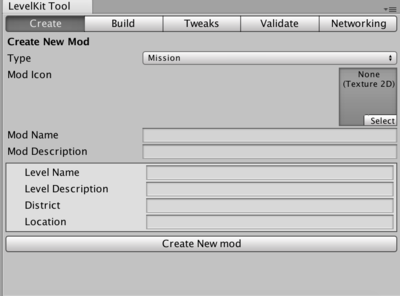 and hit the "Create new Mod"
The build tab allows you to compile your level so that you can test or upload your level. This drop down box will allow you to create a new level or select an existing level. This will open up the folder in which your mod level is stored. This will open your Mission Script for your mod within your preferred code editor. By default your Lightmaps are built automatically, when you make a change to the level. By clicking the button "Build on Demand" will stop the lightmaps automatically being created.This will help with performance while you are creating your mod. Selecting the checkbox "On Build" will allow you to generate the lightmaps as you compile your mod. A navigation mesh is used to set areas that the AI can navigate.The navigation mesh by default is generated when you compile your mod.This can be changed by unchecking the "On Build" checkbox. 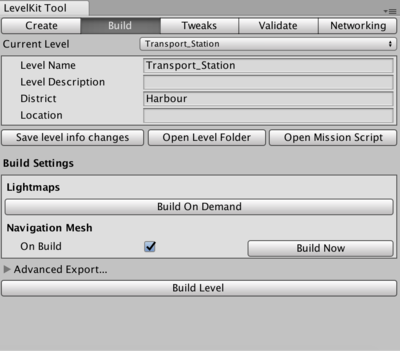 The navigation mesh can also be built on demand when you select the "Build Now" Button. The "Build Level" button will allow you to compile your level so that you can test or upload your level. The text on this button will change to let you know if any changes have been detected. This will allow you to make small adjustments to your level geometry. Fixing issues with small gaps in your geometry caused by odd rounding on the GameObject transform component.This will allow you to make your geometry conform to a single decimal. 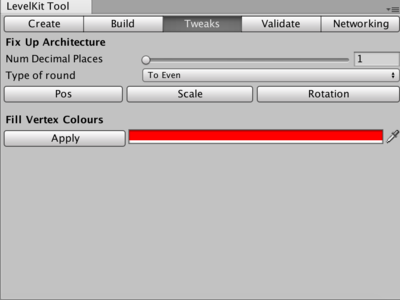 Using Fill vertex will flood the object with a new vertex colour specified by the colour bar.This is ideal for objects that only have a single colour as it will flood the entire object. The Validation Tab checks that objects within your mod are set up correctly. Be sure to check this before building your mod.Some errors can be fixed using the "fix" button that appears next to the error. 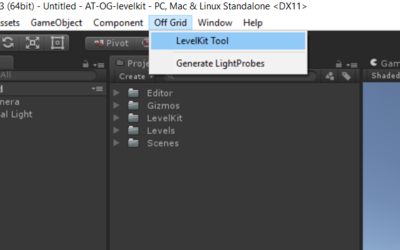 Then in the Level Kit tools window, click on the Networking tab and click the 'Search for game' button. Your window should now look like the above. Once you have connected to the game click "start" to run your level. Clicking "stop" will stop your level and return you to the main menu. "Stop networking" will remove the connection between the Level Kit and the game. This page was last modified on 11 December 2018, at 10:40.